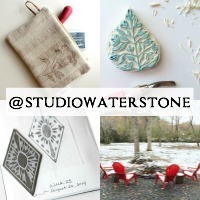 Studio Waterstone | Lori Plyler Art: how did i miss this? What the heck? I watched the Emmys and missed this. Well, I watch part of the Emmys. Came in late and left early. Being the certified Gleek that I so proudly am, I feel compelled to show you. Please don't tell me this is the 10th time you've seen it. Humor me. Haha! Kelley, you crack me up. Now I don't feel so bad. I'm curious if everybody else can play it. I was able to play it on Firefox and Safari without a problem. I am seeing it for the first time, I am a certified Gleek too, but I couldn't sit through the Emmys. Thanks for the post, loved it. Waiting for Sept. 21. Yay! That was awesome! I missed the Emmys so I just watched that...twice. I didn't watch the Emmys but I love this video! (I saw it on YouTube, so I haven't played yours yet.) I need to be sure and at least watch the opening segment from now on! I could watch that every day. That was soooo good, I'm a gleek too! That was awesome! Love it! I somehow missed this too - it was the BEST part of the show !! !I saw 1/2 the Emmys and where was I for this who knows - LOVE !! !